A state prosecutor had sought to charge Goodman with participating in a “riot” for filming an attack on protesters. A North Dakota judge has dismissed the “riot” charges against Amy Goodman for covering the Dakota Access pipeline protests, Democracy Now! confirmed Monday. 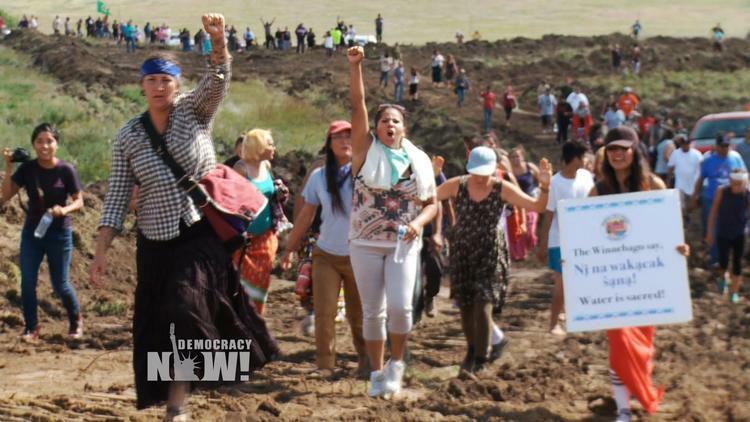 “This is a complete vindication of my right as a journalist to cover the attack on the protesters, and of the public’s right to know what is happening with the Dakota Access pipeline,” Goodman said in a statement on the website of Democracy Now!. A North Dakota state prosecutor Ladd R. Erickson had sought to charge Goodman with participating in a “riot” for filming an attack on protesters after the prosecutor dropped criminal trespassing charges. On Monday, District Judge John Grinsteiner found there was no probable cause in the charge against the Democracy Now! journalist. Actress Shailene Woodley and Green Party presidential candidate Jill Stein are other well-known figures who have been arrested for their protests over the US$3.7 billion project. The pipeline is expected to transport over half a million barrels of oil a day through federal and private lands in North Dakota, South Dakota, Iowa, and Illinois. Indigenous and environmental activists say the project will ruin sacred burial grounds and pollute local water supplies. While construction has been stopped along small sections, protesters have vowed to continue fighting the project until it is fully shut down. “I wasn’t trespassing, I wasn’t engaging in a riot, I was doing my job as a journalist by covering a violent attack on Native American protesters,” said Goodman.